Principal Hoops was speechless Friday after totaling the pounds of pop tabs brought to Chanute Elementary for the Leadership Team’s drive to raise money for Ronald McDonald House Charities. This is the second year the leadership team has held a three-week class competition with prizes awarded to the class that brings in the most pop tabs each week. Hoops said he expected they would meet their goal and fill a barrel last year because people who typically save pop tabs would donate to the cause. 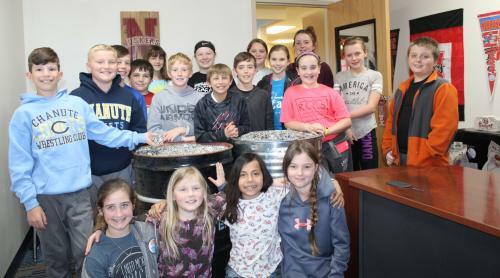 Friday’s collection from the classrooms topped off the first barrel in Hoops’ office and filled a second with 178 pounds of pop tabs. That brought the drive total to 344 pounds. Two classrooms tied for the most, with 38 pounds apiece, and will be treated to a pizza party. It looks like there will be some pie throwing and some duct taping taking place, Hoops conceded. For meeting the goal, all the CES students will get to help duct tape their three principals to the wall and add a pie to their faces during an all-school assembly The date for that event has not been determined. 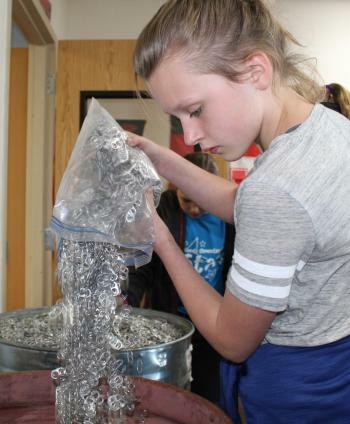 The pop tabs will be recycled at Gericke Iron and Metal, and the proceeds turned over to the Ronald McDonald House at Kansas City, to assist families who have children in the hospital.